GOD might have been on side with the wrong team in the opening game of the 2018 State of Origin, but a few young Queensland men still have faith in His call for them to be priests. Brisbane archdiocese’s director of vocations Fr Stanley Orji said on the night Queensland lost to the Blues in the 2018 State of Origin rugby league opener two men put their hands up to discern the priesthood next year. 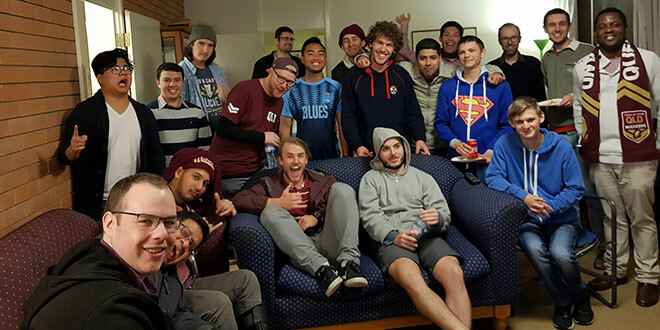 The men were among more than 30 who gathered at the archdiocese’s vocation discernment house Canali House for Game One of the State of Origin. “Whether you want to say that Queensland just let-off NSW this time – to keep the series more alive and exciting – or that we just lost the game, it was certainly a ‘big win’ for vocations as two men approached me on the night and said they would like to join Canali House next year,” Fr Orji said. Canali House is already home to three men considering the priesthood in Brisbane. Daniel O’Connor is one of three men from Queensland spending the next year in the house discerning the call to the priesthood. The house provides Mr O’Connor a chance to continue studying or working while also praying about becoming a priest, or as was the case two weeks ago, for Queensland to win the State of Origin. While he may have watched his beloved Queenslanders lose Game One in Australia’s greatest sporting rivalry, he believes the recent get-together to watch the series had some significant religious undertones. Specifically, the night reminded him of how Jesus had meals with various groups to foster connections and community. Jesse Smith is another young man from the Nundah parish who is spending the year in Canali House. He said State of Origin could still be a significant night in a priest’s pastoral ministry. “The State of Origin is part our culture, and allows people to come together from all walks of life to support a team in a fun and light-hearted way,” Mr Smith said. Fr Orji said when men gathered to watch their favourite sport, there was also a chance to talk about God’s plan for their future. “Before the game started I spoke briefly on personal calling and future events at Canali House for discernment, prayer and social evenings, and in my mind one of the next big events will most likely be a World Cup game, between Australia and Nigeria, where Nigeria will beat Australia,” Fr Orji said. “Regardless who wins or loses, it would be another ‘big win’ for Vocation Brisbane as young men would come again to discern and celebrate their vocations. For more information about Canali House or to talk about your call, contact Vocation Brisbane on 1300 133 544.